Some of the items sold since 2003 at OneSwitch adapted for switch access. These items are no longer available. If you find a working example of anything below, I would be happy to consider adapting it for you. See the Adaptation Service page for more examples and information. 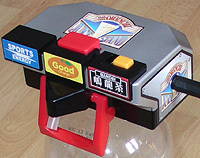 Switch adapted drinks dispenser from Bandai. New old stock imported from Japan. One only in stock. 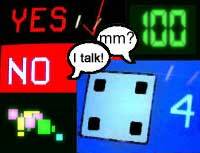 Switch adapted electronic dice with lights and sound. 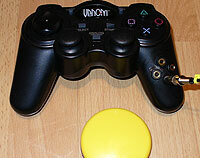 A switch adapted joypad for use with Playstation One games. Add a £5 USB adapter to play switch games on a PC. Imperfect condition but working 100% as described. Use an accessibility switch to pick lottery numbers. A simple recording and playing device that can be supplied adapted for plug-in switch use, or unadapted for standard use. A BBC Micro computer, switch interface and suit of switch accessible software stored on ROM. 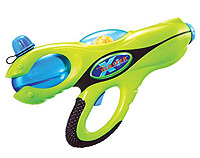 A switch adapted battery powered water-pistol. 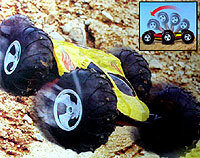 A flipping Radio Controlled Car switch adapted for forward and reverse turn. 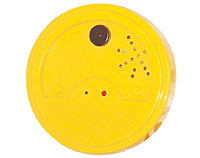 A two switch adapted radio controlled inflatable robot. One switch spins the other drives the robot forwards. 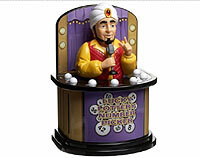 includes a loud speaker and microphone set-up which is not switch adapted. 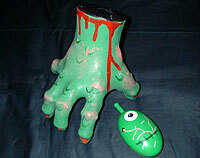 A great halloween toy or perhaps horror film prop. A switch adapted radio controlled crawling hand.